I never learned much grammar in high school. I always thought of it like a sort punishment, like mindless memorization or a terminal disease. And apparently my teachers did too. But St. John’s has encouraged me to be more careful with my writing, and I’m finding myself turning to my mom’s old College Grammar Handbook more and more; it’s hard to write clearly without some understanding of grammar. Like the example from Luschnig’s An Introduction to Ancient Greek, there’s a difference in saying, “Driving by, I saw the Grand Canyon,” and, “I saw the Grand Canyon driving by.” We don’t want anyone to think we’ve been sampling the local hallucinogens when we’re just trying to describe a family road trip. 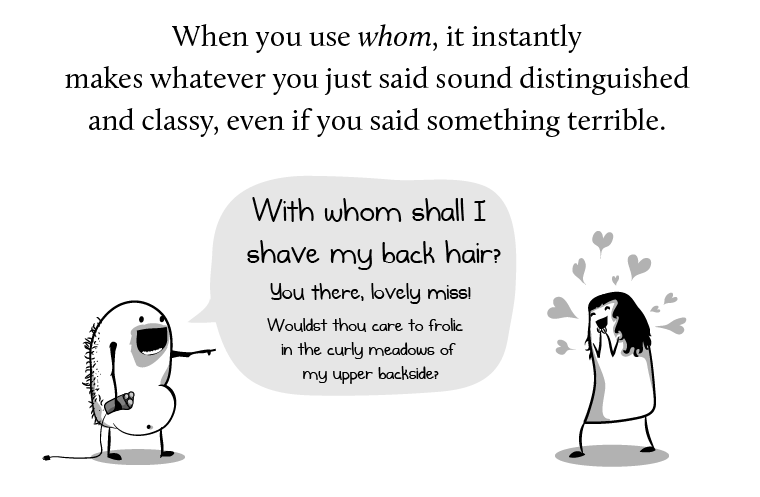 Unlike a dangling participle, using whom correctly doesn’t do much to improve clarity. We’re so used to hearing “who” as the object of a sentence, it doesn’t even sound that much better. But it’s always fun to know.